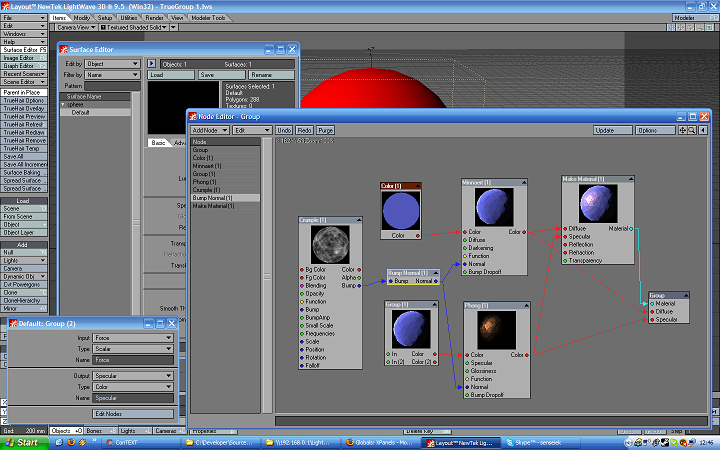 TrueGroup is LightWave special node to better organize nodes in editor. It allows adding, removing, cloning, renaming, changing type of any input or output. There is no hardcoded limit of inputs and outputs. Using TrueGroup you can make your own custom materials or shaders, that look like real nodes. You can load and save group as one node for use in other projects, without having to carefully select nodes in group. Editing nodes in group is done in separate Node Editor independent from regular Surface Editor's Node Editor. You can have multiple nested TrueGroups, one inside of another, without limit. You can store group data in external storage file. Editing inputs at any time (adding, removing, cloning, changing type, renaming). Editing outputs at any time (adding, removing, cloning, changing type, renaming). 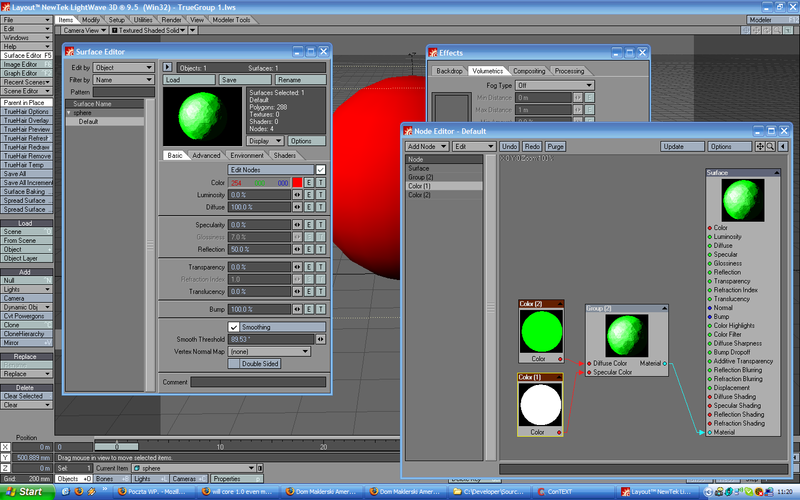 Easier copying nodes (select and copy just one nodes, instead of complex setup). Building custom materials and shaders. Workaround to IFF sub-chunk 32 KB limitation in complex node setup. Working with real-time interactive renderers such as TrueHair Preview. On the left image you can see the plugin control panel. [new] to create new element (duplicate of currently selected element). [delete] to delete currently selected element. Type can be Scalar, Integer, Color, Vector or Material. Name edit this field to rename currently selected input or output. Edit Storage File field or click on Pick Storage File to open file requester. After specifing storage file, nodes will not be longer saved in LWO object file, but to that file. Only reference to file will be saved to LWO, saving a lot of space in sub-chunk. This allows bypassing IFF sub-chunk 32 KB limitation! Storage file is saved in ASCII mode, therefore you can edit it in any text editor such as Notepad! So, if you accidently added node which is crashing LightWave during object loading, you can quite easily find it and remove, without loosing object, or carefully edited node setup. Click on Flush Storage File to stop using reference to file. Nodes are loaded from storage file when Load Object is performed in either Modeler or Layout. Same with Save Current Object or Save Object As...When rendering on render farm like Screamer Net storage file must be accessible to the all rendering nodes! 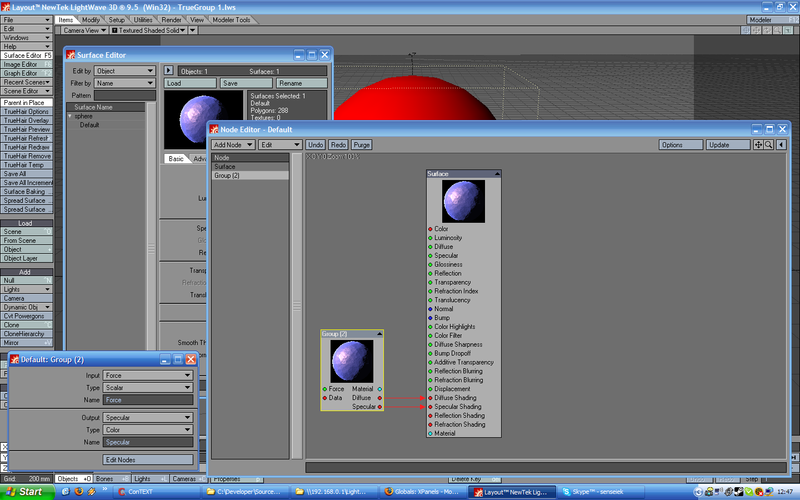 Press Edit Nodes button to open separate Node Editor where you can put group content. To read inputs edited in group node panel, you have to add Group Params node. While starting it will scan inputs in group it belongs to, and build outputs with exactly same type and name, and connect them internally with group. So after adding new inputs in group, you have to add new Group Params. It's advised to download videos to disk using Save File As... and watch in off-line movie player. This video shows TrueGroup at work. Change YouTube quality to Full HD! Download 1st animation (25.347 MB) illustrating TrueGroup node at work! The first official Macintosh release. Windows XP ® has built-in ZIP support (simply right click on the archive�s icon, and choose �Extract all files...�). 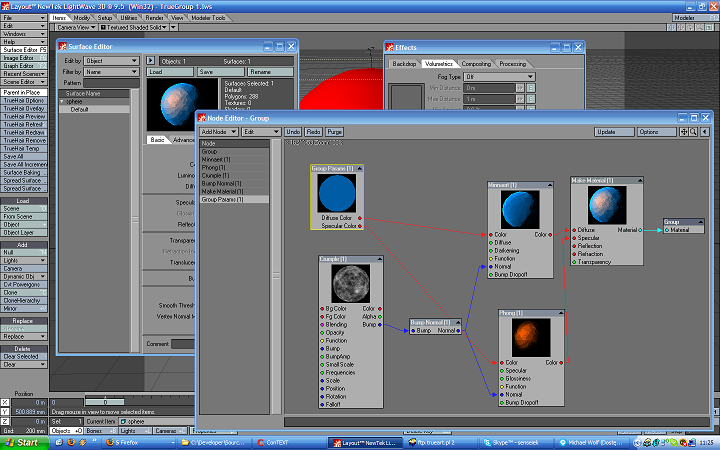 Run the LightWave ® Layout executable. Select pop-down menu Layout > Utilities ® Add Plugins..., then find the folder containing the new plugin files and select them. You should see a message from LightWave telling you that the plugins have been added successfully. The changes will be saved to your configuration file when you quit the program. 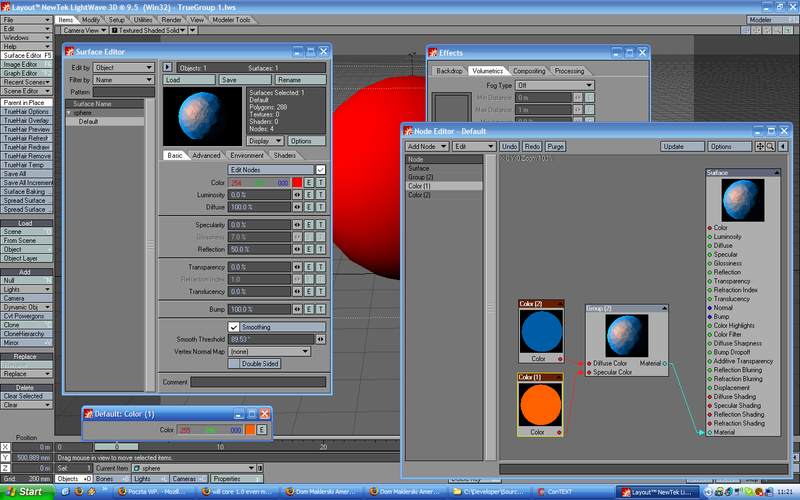 Run the LightWave ® Layout executable. Select pop-down menu Layout > Utilities > Edit Plugins..., then select the plugin files and press the Delete button. The changes will be saved to your configuration file when you quit the program. Now you can safely remove the files from your hard disk. The price for a single license (product installed on the one machine) is 30 USD (United States Dollars). Safe. You are sure your order won�t be stolen in transit, or held up by postal strikes etc.